The latest and final waterfront development at The Water’s Edge is aptly named The Grande Villas, and it offers the ultimate in luxury living. 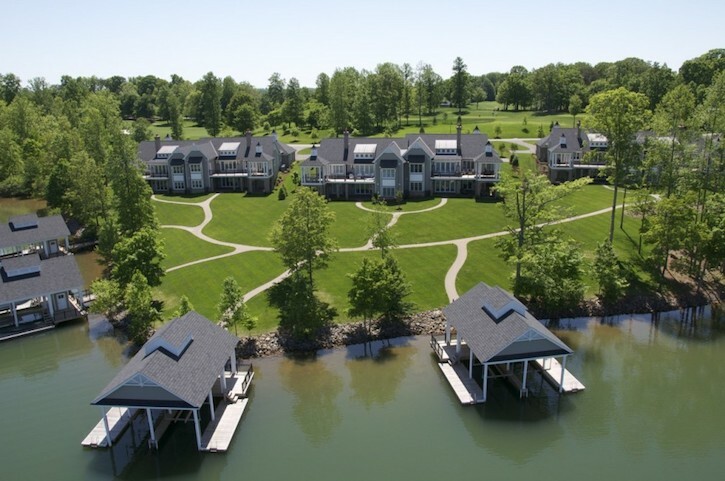 Here in this gorgeous lakefront enclave you will find six beautiful townhomes with wonderful views of Smith Mountain Lake and the signature no.7 island green. These sustainably built EarthCraft homes are designed to increase your comfort, save you money and have a smaller carbon footprint. They are 30% more energy efficient than an average home, thus lowering your utility bills while at the same time protecting the environment. What’s more, EarthCraft homes tend to have great resale value. These elegant homes offer up to 4,900 square feet of indoor living areas as well as extensive outdoor living space. The high-quality construction and craftsmanship and attention to every detail will delight you. Even the lawns are irrigated for you. This community is gated and features a security entrance, so you can relax in peace. There are two unique designs for you to choose from, and all townhomes have access to the shared dock where each will have its own storage, covered slip, private deck, and floating dock. The 18-hole championship golf course has been described as a gem. Sitting by the waters of Smith Mountain Lake with the mountains as backdrop, there are stunning views from every hole – and hole number 7 is truly amazing, extending out into the waters for a real challenge. The course is maintained to a very high standard and kept in tip-top condition. There’s also a driving range and a pro shop. All residents are eligible for membership to the exclusive Water’s Edge Country Club, which offers a full range of activities, exceptional facilities, and a variety of social events held throughout the year. The lake offers many activities – the bass striper fishing is said to be some of the best in the southeast. Go boating, swimming, tubing, or simply explore the miles of coastline right on your doorstep.